Soft, 7" durable cotton/elastic construction provides compressive support. 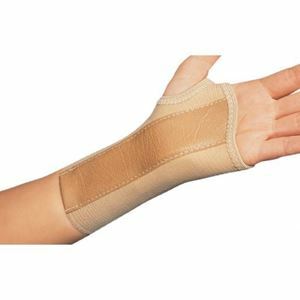 Contoured elastic body and preformed aluminum stay for anatomically correct fit and proper support following mild sprain, strain or cast removal. Contact closure straps for ease of application. Designed to prevent brace from extending beyond palmer crease allowing full finger range of motion. Ideal for Carpal Tunnel Syndrome and immobilization of the wrist.